When I was a kid, the Keebler company used to make these things they called Rainbow Cookie Stix. They came in a square blue package and were a crisp, buttery sugar cookie with sprinkles mixed in the batter and shaped in tiny little stick shapes, with about the thickness of my finger. I thought they were sooooo good. They weren’t overly sweet, but definitely had that buttery vanilla flavor that reminded me of sugar cookies. I most liked to eat them dipped in those cannisters of pre-made vanilla frosting–you know, the ones I absolutely cannot stand now because they taste like overly sweetened paste. The Rainbow Cookie Stix have been discontinued for what I’d guess is at least over fifteen years now, but every now and then when I get the munchies I’ll remember them. When I was putting together the recipes I would make for this years 12 Days of Christmas series, I thought of them again and how cool it would be to be able to recreate them somehow. Crinkle Cuts are the best type of fry there is–don’t debate me on this, there’s just no point. You’ll lose the argument every time. I knew that this dough would work fine if I just used my bench scraper to cut them into strips, but since this was Christmas I knew I wanted to give them a special, ‘festiv-y’ look. If you’re like me and you love kitchen gadgets (especially inexpensive ones), then I’m positive that you’ll love this pastry wheel I found on (where else?) Amazon. It has a dual wheel that can cut both straight and fluted edges on doughs–pie and cookie. The scalloped edge on my cookie fries come from using the fluted wheel. It’s larger than I expected it to be, durable and easy to use. I found it a very worthwhile buy. If you’d rather not get it, that’s totally fine; you’ll just have shoe-string fries rather than crinkle cuts. Because I wanted to recreate the flavor of the Rainbow Cookie Stix, I kept the flavors of this simple and only used sugar and vanilla bean paste to flavor my dough. In the future I can certainly see myself experimenting with different flavors and extracts as this is a very versatile recipe. A few teaspoons of the Winter Spice Mix I’ve used in other recipes in the series would work very well for this, as would pumpkin pie spice or apple pie spice. I sprinkled white sugar on top of the fries just before baking to give them added crunchy texture. They baked up perfectly golden brown. These would be perfect for a cookie swap party, or just a regular Christmas party in general–not just because there’ll be plenty to go around, but because you can serve with them so many different dips and sauces: frosting (REAL frosting, not that crap in a can for God’s sake), jam or fruit preserves, melted milk or white chocolate, Nutella spread, or even peanut butter. I really couldn’t have been more pleased with how these turned out. They were exactly what I was going for and they gave me a nice feeling of nostalgia. Only two more days left of the 12 Days of Christmas series–yikes, how did that happen? Stay tuned for our last two recipes–you’re gonna love em. In the bowl of a standing mixer, or using a handheld one, cream together the butter and sugar until light and fluffy. Add the eggs, one at a time, then the vanilla. In a medium bowl, combine the flour with the baking powder and salt. Add the flour mixture to the butter mixture in 1 cup increments, scraping down the sides of the bowl to ensure even mixing. Gather the dough together in one mass, wrap in plastic wrap and refrigerate overnight. Preheat oven to 350 degrees Fahrenheit. Divide dough in quarters, keeping the other 3 in the fridge while you roll out the other on a clean work surface that you sprinkle with flour. Roll out dough into a large, thin rectangle. 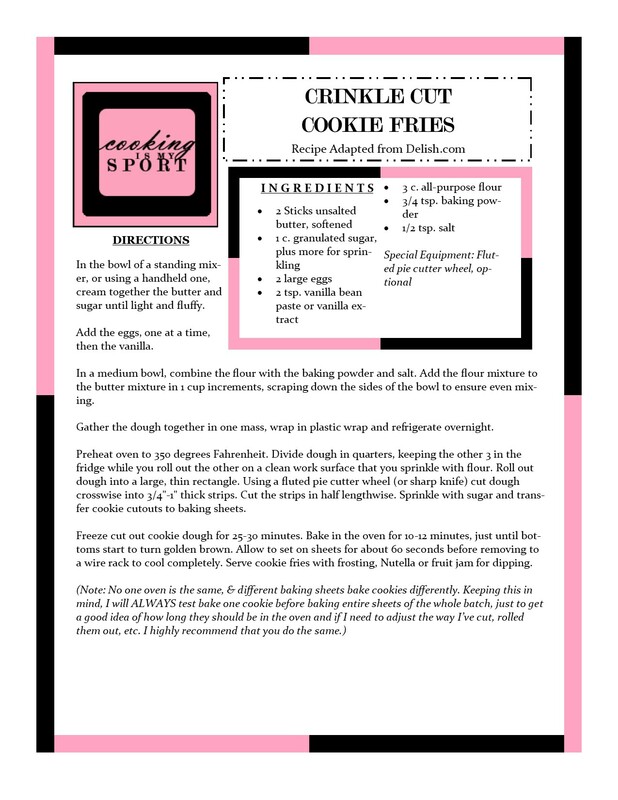 Using a fluted pie cutter wheel (or sharp knife) cut dough crosswise into 3/4″-1″ thick strips. Cut the strips in half lengthwise. Sprinkle with sugar and transfer cookie cutouts to baking sheets. Freeze cut out cookie dough for 25-30 minutes. Bake in the oven for 10-12 minutes, just until bottoms start to turn golden brown. Allow to set on sheets for about 60 seconds before removing to a wire rack to cool completely. Serve cookie fries with frosting, Nutella or fruit jam for dipping. I keep thinking of piping these in chocolate. They would be DELICIOUS with chocolate. Try it sometime! Thank you!